Guests visit the Land of Enchantment for a variety of reasons. Some come for the stunning landscapes, which are some of the most distinct and original in the entire country. Other visit the City Different, one of the oldest cities in America, for its treasure trove of unique history, architecture, and culture. And some venture here to rest and get away from everyday life. There are plenty of places in our city to relax, but few are better than the top spas in Santa Fe. These aren’t the only relaxation palaces in New Mexicos capital city. Request your free copy of our Santa Fe Travel Guide for more of the top places to visit while you’re in town! Nidah Spa offers a tranquil setting, candlelit ambiance, and superb spa treatments. This Santa Fe spa has seven treatment rooms, including a couple’s suite. The crowning jewel of their extensive treatment options is the Spun Gold Treatment, which begins with a gentle dry brushing of the skin while slowly adding hot stones and chamomile oil infused with flecks of gold. Santa Fe Oxygen and Healing Bar is one of the most unique spas in Santa Fe, NM. In addition to the spa, you’ll find a cafe with poetry readings and live music. Enter the creative atmosphere and discover a different kind of relaxation. Healing treatments include oxygen, a balancing flower essence tonic, crystal aromatherapy, and an infused elixir cocktail from the Infusion Bar. BODY of Santa Fe has everything you need for a relaxing day at the spa. A yoga studio, cafe, and boutique combine into one wellness center retreat. Attend a yoga or Nia session before stopping in for a selection of healthy and delicious meal options that are wheat, dairy, and sugar-free. A variety of rejuvenating spa services include a Lomi Lomi treatment and an Espresso Mud body scrub. Ten Thousand Waves spa in Santa Fe, NM features hot tubs, massages, skin care treatments, and other spa services. The hot tubs emulate the design of hot springs in Japan for ultimate relaxation. Ten Thousand Waves keeps things exquisite but simple, offering a limited list of premium massage services. Enjoy a Japanese shiatsu massage or indulge in a deep stone massage to calm your entire nervous system and bring you to an ultimate state of relaxation. Discover divine bliss blocks from Santa Fe Plaza at Absolute Nirvana Spa & Gardens. This Santa Fe, NM spa offers authentic Balinese treatments as well as hot stone, therapeutic, and Thai massages. If you’re looking for something a little different, their Chocolate Decadence treatment includes rose and chocolate massage oils, a papaya puree body mask, and a brown sugar and cinnamon exfoliating scrub. The Santa Fe Spa at the Four Seasons Resort Rancho Encantado is the place to go for those searching for the most luxurious spa in the City Different. This state-of-the-art relaxation haven features an array of regionally inspired body treatment, facial scrubs, and other energy balancing services. The resort is only 15 minutes north of Santa Fe’s city center. 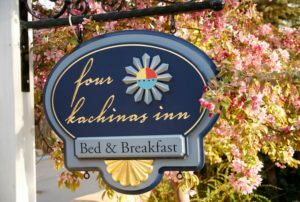 Continue Your Relaxation at Four Kachinas Inn! 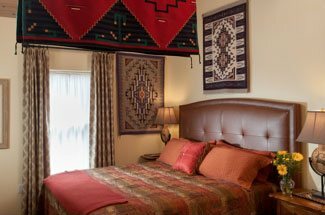 Four Kachinas Inn is your key to a relaxing and memorable getaway in Santa Fe. Our beautifully decorated rooms feature Southwestern accents and furnishings for a unique stay. Your room is steps away from the heart of Santa Fe, where you can enjoy the best things to see and do in the city, including Santa Fe Plaza, Loretto Chapel, and several world-class museums. There are tons of hidden gems and popular attractions around the city that you can explore from our charming Inn! 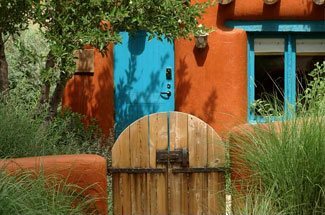 Start planning your Santa Fe retreat by booking your room today! We look forward to welcoming you to our incredible town.